Thursday night before my big journey, I got lucky. I found a brand new Citi Bike. Not just a new model bike, but a new new model bike. The spokes sparkled. The bell chime could summon angels. Leading up to departure, how was I going to select a good bike without incurring the late/loss fee before I set out? I wanted overtime fees to kick in once on the ferry to New Jersey because by then there was no going back. The plan was to find a bike early Friday morning before East Village commuters plucked them from the racks on their way to work (hope y’all get Summer Fridays!). 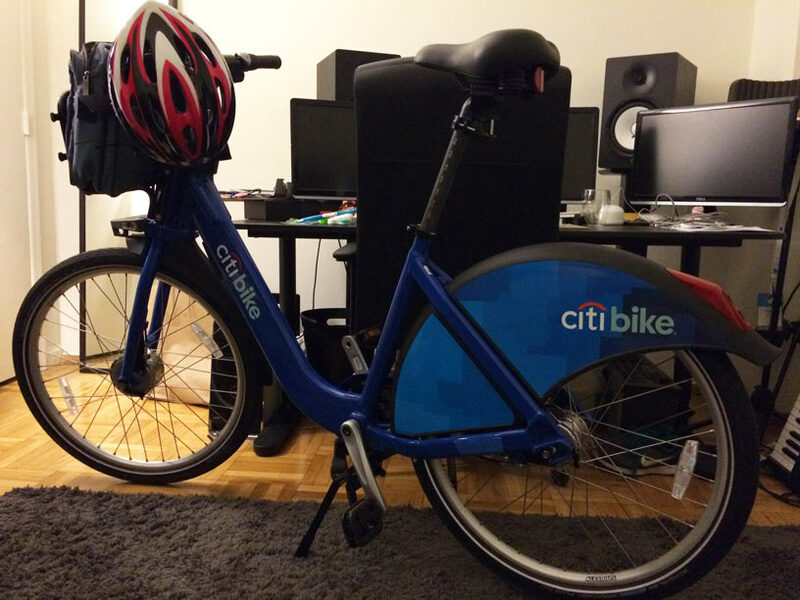 Finding the right bike would be trial and error, but Citi Biking is kind of like dating. Within 11 seconds, you know if it’s a match. Once I found The One, I’d ride back to where I was staying in Stuyvesant Town and chain it to pole. Then I’d bring Travoy down and link up. That’s a lot of pressure a few hours before departure and just 12 hours before my annual membership expired. As fate would have it, the perfect bike presented itself the night before Friday. I was coming home from Mexican food and margaritas at Maya on the Upper East Side. After a call with my brand strategist and one final attempt to assuage my frantic parents, I biked home. From the bike rack under the Queensboro Bridge I selected a new model bike—easily identifiable by its signature rear bumper light. I also saw its zip tie was gray, the color for August, meaning it had just been serviced a few days ago (see Tip #7). The bike felt great. So great that at every red light going down 2nd Avenue I hopped off to inspect it. The bike looked uncommonly pristine. At 42nd Street I wondered if this was The Bike. At 34th Street I knew what had to be done. At 20th Street I docked one final time. Off the clock, I inspected the bike like crazy—touching and tugging the parts—everything but licking the frame. Around 11:30pm a woman rode the wrong way across 20th Street to dock. As she unloaded grocery bags, I felt a great need to talk. “Excuse me,” I said, causing her to pause under the street light. She looked at me, down at her groceries and then back at me. I explained to her that I had just found the best bike in the system—so lightly ridden it could pass for a true virgin! I didn’t know, but I told her I wanted to try. I had been thinking about this for so long that I just had to do it, but I was scared. “When you get that feeling of fear, it means you’re doing something right,” she said. I love New York. Just when I needed a bike-friendly lawyer in my corner, I meet one on the street. I told her how Citi Bike was the best part of my former job, and so I ditched the job to bike full-time. Just as we were exchanging Instagram handles, powerful headlights beamed onto us. Oh God, the police are already after me was my first thought. It was some truck with a hose. A man got out and started blasting bikes on the far end with water. Or maybe pesticide? I’ve never seen any bike wash trucks. Suspicion quickly yielded to terror. No, don’t get my bike wet! I inserted my key to release the bike, and, for the last time, heard the dock’s reassuring brrrrrrrrrrring when the bike unlocks and is ready to use. The trip is still open. What a trip it will be. Older PostOh Boy, Rollin’ with Travoy!